The story goes, back on the night of May 1st, 1971, a large creature appeared at the new home of Bobby and Elizabeth Ford. They had moved into this Fouke-area home less than a week before. She thought a bear was reaching through a screen window while she was asleep on the couch. He and his brother Don had just returned from a hunting trip and scared it off. Or so they thought. After midnight, the larger-than-human creature reportedly grabbed Bobby Ford by the shoulders as he stood on that porch. Ford managed to crawl free. He was treated at a local hospital and scratches across his back. Now, though the Fords shot at the creature several times, there was no blood left behind, but there were strange footprints with just three toes, along with scratch marks on the siding and windows of the house. were found. The old radio station KAAY even offered a $1090 bounty for someone to bring it in (KAAY's number on the AM dial was 1090). Like many other panics, this one got out of hand, and the sheriff eventually had to put a no-guns policy in effect. Citations were handed out for false monster reports. Interest waned. That is, until a little documentary was released. The Legend of Boggy Creek came out in 1972, and it ended up drawing in about $22 million dollars. It was popular at drive-in theaters and it caused yet another round of stirring about. But even with that, people slowly forgot about it. 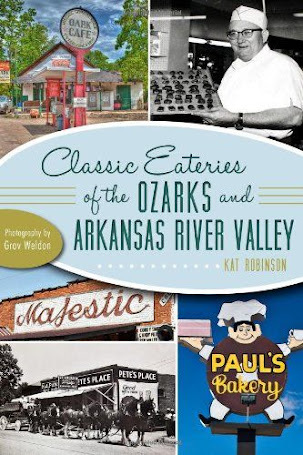 There were reported sightings in Russellville and Center Ridge -both hours away from Fouke - and more movies were made. Over the years, if animals went missing or a dog came back suffering from an attack, the Fouke Monster was blamed. There were some sightings reported in the 80s and 90s. And then Lyle Blackburn released a book in 2012, The Beast of Boggy Creek: The True Story of the Fouke Monster. That stirred interest up again, and that prompted an investigation by Animal Planet. 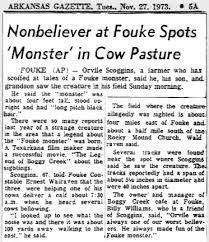 Still, after all these years, there's been no conclusive evidence found that the Fouke Monster existed. and were looking for something else interesting. 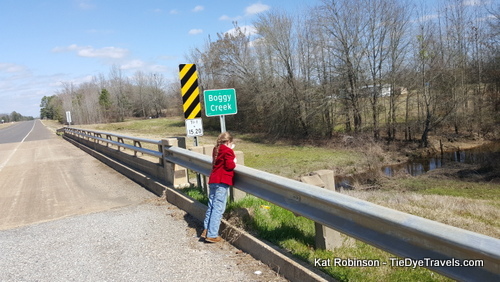 That interesting thing was where US Highway 71 crossed Boggy Creek. 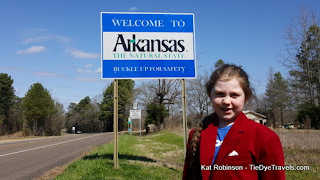 Not surprisingly, Hunter hadn't heard of the Fouke Monster, but she had heard of Bigfoot, and I quickly related the story to her of this strange apparition that had legendarily strolled the landscape of southwest Arkansas those years ago. So as we drove along, she kept her eyes open. And, what do you know, she spotted something! 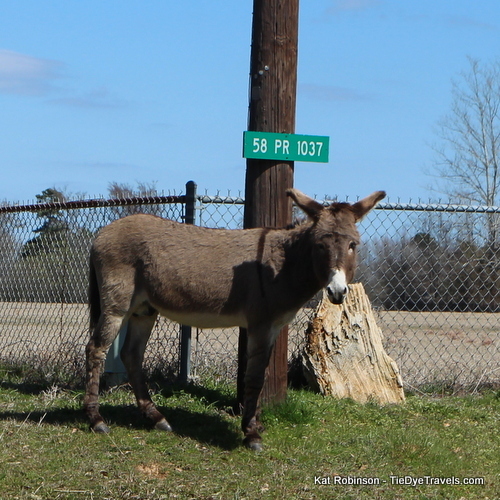 Turns out, it was another random mule. 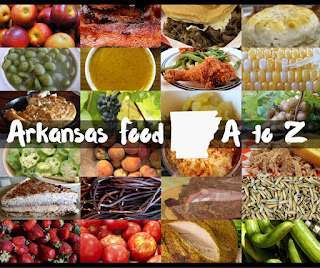 Is this a THING in far southwestern Arkansas? 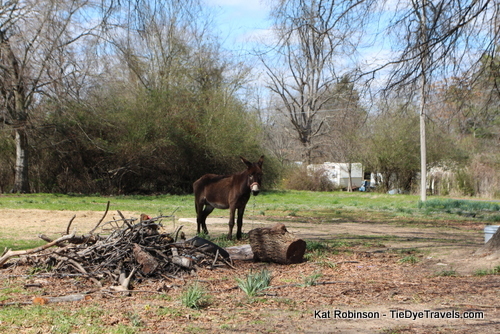 So we photographed the second mule as we had the first one, and got back on the road. And not 20 seconds later, Hunter hollered out "I FOUND THE MONSTER." That's right, not two blocks up the road, there was Monster Mart, a decidedly unusual convenience store on the east side of the road. Of course we had to go check it out. Inside to the right, there's a museum of different artifacts... well, assorted stuff, really. More like a photo opportunity. 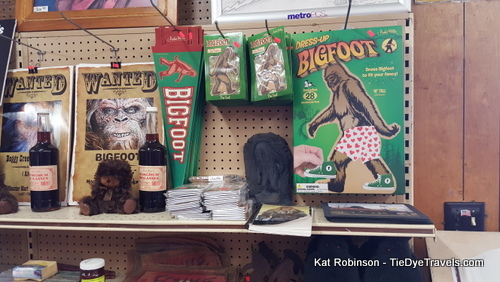 There was a big Jack Links sasquatch cutout and various signs and paintings of the Fouke Monster as he is believed to be. 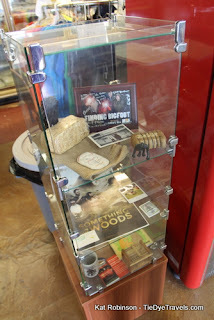 There were also cases of different memorabilia and artifacts, with just about everything you can imagine inside. Okay, you may be able to imagine more. But it was interesting and cool and certainly not the sort of thing you see in most convenient stores. There were also a LOT of cypress knees and renditions of cypress knees. 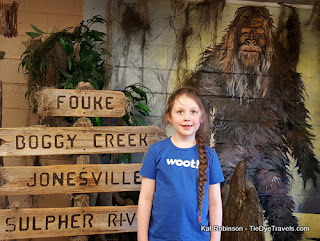 And just when I thought there wasn't anything else to see, I turned around and saw a whole wall of Fouke Monster merchandise. Okay, more Bigfoot than Fouke Monster. 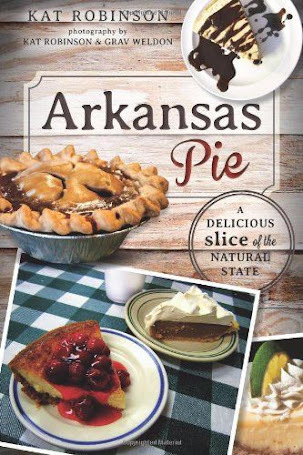 I suppose old Fouke-y isn't as popular as his northwestern U.S. big brother. Still, pin the shorts on Bigfoot seems a bit far to go. 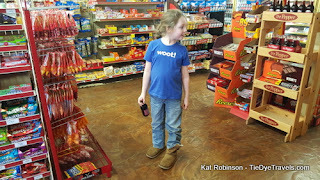 great things inside the convenience store, though -- lots of retro merchandise like sugar Dr. Pepper in glass bottles and old fashioned candies. The Monster Mart has a lot of things geared at folks who are planning to hit the outdoors, not just for Fouke Monstering but for hunting and fishing as well. 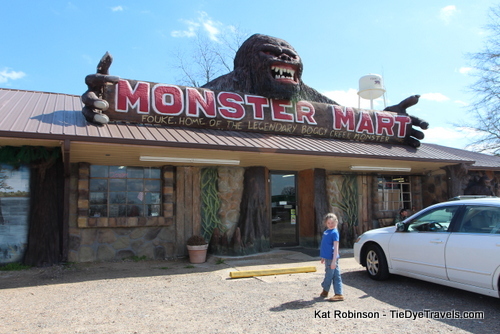 But you don't have a facade like the one at Monster Mart and not expect to get folks looking for that Fouke Monster. 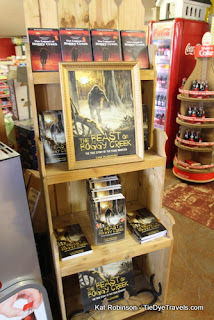 You can purchase The Legend of Boggy Creek there, and the book as well, and lots of people do that. 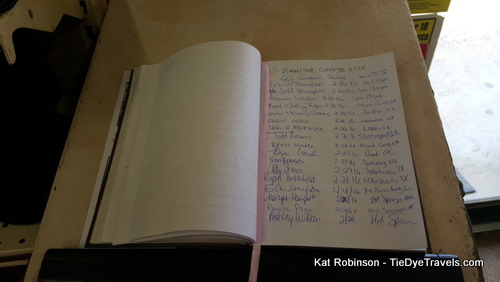 There's even a guest book full of names of people who have dropped by. We grabbed a couple of sodas and headed onward towards our next destination, Allen's Burger Center. And I didn't think too much about our stop until I started writing this piece today. I went back and edited my photographs too. 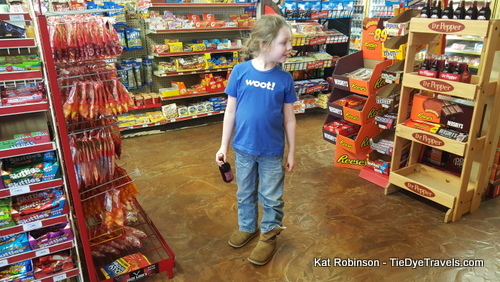 And for a moment I really wondered... could that really be the Fouke Monster in this accidental photograph, wearing blue jeans? I shook my head and zoomed in. Okay then, probably not. Where would a Fouke Monster get jeans, anyway? One more thing... the next night, as we're heading to Queen Wilhelmina State Park, we were driving out of town on Arkansas Highway 88 when Hunter hollered "THERE'S THE MONSTER!" 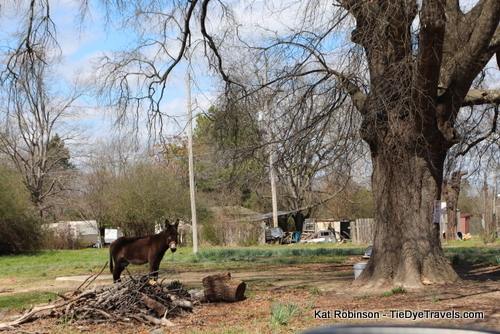 Yep, even in Mena, quite a ways north, you can think you've sighted the Fouke Monster in someone's yard. And the legend continues. 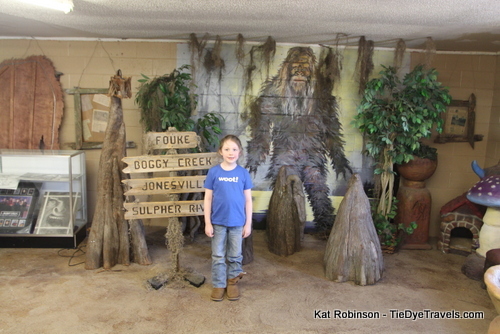 If you'd like to read more about the Fouke Monster, visit the Encylopedia of Arkansas for an excellent article. And if you're in the area, be sure to check out Monster Mart. Read about similar efforts to document sasquatches (or are they sasquatchi?) in White Hall, here. 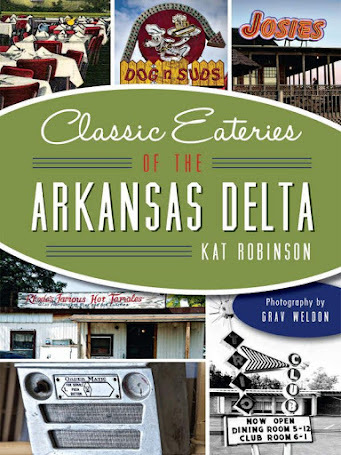 Next stop: Allen's Burger Center in Fouke. We also spotted Elve's Peanut Patties at Monster Mart. I love reading about your adventures. 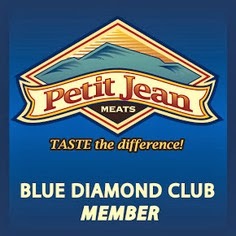 You have the best job in the world!